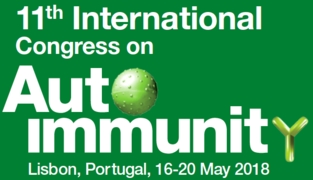 Join us in Lisbon to enhance your knowledge of autoimmunology with the world's top experts. The 11th International Congress on Autoimmunity is the only meeting where you can learn about more than 80 autoimmune diseases from a variety of perspectives, both research-based and clinical. We will discuss the newest therapeutic techniques and diagnostic tools as well as the most up-to-date research on genetic, etiology, diagnostic, clinical aspects and novel therapies of autoimmune diseases. We look forward to seeing you in Lisbon on May 16-20, 2018!